Dr. Reece and his Team support and highlight our fine community and friends. This was a cake Sweet Memories made for D Reece to present to Jabob Sutherlan, our patient. He and his team qualified to go to the World Series. As you can see, a very proud young man. CORSICANA, Texas � Boater Mark Beckmann of Bryan, Texas, won the Wal-Mart Bass Fishing League Cowboy Division tournament on Richland Chambers Reservoir Saturday with a five-bass catch weighing 20 pounds, 11 ounces. The victory earned Beckmann $2,124 and placed him one step closer to qualifying for the Lake Ouachita Regional Championship in Mount Ida, Ark., Oct. 23-25, where he could ultimately win a new 198VX Ranger boat and a Chevy truck. Distinguished Achievement Award Winner in A&M Administration Announced Texas A&M University and The Association of Former Students selected Joe D. Townsend (Dr. Joe `67) to be honored with 2008 Distinguished Achievement Award in Administration. Joe served as Associate Dean for Students in the College of Agriculture and Life Sciences. In 2008, Distinguished Achievement Award was formally presented at 1:30 p.m. April 29 during ceremonies in Rudder Theater on the Texas A&M University campus. In recognition of his achievements, Joe received a $4,000 check, an engraved watch and a commemorative plaque. The Association of Former Students, established in 1879, is the official alumni organization of Texas A&M University. The Association connects the 450,000 members of the worldwide Aggie Network with each other and the university, and provides more than $4.3 million a year in funding for scholarships, awards, activities and enrichment for students, faculty, staff and former students. Sharon Reece, wife of Dr. Michael Reece, was one of 12 women honored at the You're the Tops luncheon. The event celebrated women who make a difference in their community through volunteerism. Congratulating Mark Conlee, former mayor of Bryan, Texas. The election was held May 12, 2007. Former Mayor of Bryan, Mark Conlee, holding his grandson, Robert Conlee Griffin, election night. American Heart Association's Fundraiser: Heart Rock goes Polyester...celebrating the 60s, 70s & 80s. 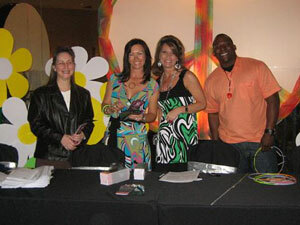 Event was held March 2007 at Pebble Creek Country Club. Photography exhibition of the flowers that makes Rosenwood beautiful at the Brazos Valley Art Museum.